“Sales Strategy”, “Sales Force Design”, “Customer Engagement” are some of the concepts that affects hundreds of decisions and end results in the sales organization. This is relatively easy to apply from Top to Bottom, from concept to action. Once the concept is clear, the process can be set, and the decisions can be planned to execute; But what if the problem is only clear in the bottom? What if our concerns are raised in a specific unit of a specific sector of our sales organization? And this usually is the case. Q1: Is it a good idea to hire only people with sales experience? The answer is No. Experience brings you capabilities and competencies that you surely want to look for, such as negotiation, closing, and product/industry knowledge, but if you want to build a long-term goal then you might want to look for crucial characteristics as well. Motivation, Drive for achievement, good listening, analytical mind, adaptivity, persistence are some of the crucial characteristics that you really need to look for in a sales position candidate to cater for the job success and the sales organization healthy development. Q2. Which selection is more efficient: an excellent sales manager with an average salesperson, or an average manager with an excellent salesperson? The direct answer would be: excellent salespeople if you are looking for short-term goal achievements; and excellent sales manager if you are looking for long-term goal achievements. A way to reason it is that an average manager tends to surround her/himself with average salespeople, so the new hires would be average, and excellent salespeople would eventually find themselves out. However, a class A manager will look for class A salespeople, and highly develop the average existing team. The best solution would be excellent manager with excellent people which is very hard to attain, so the second best thing would definitely be an excellent manager for the long-term sales organization optimization. Q3. Is it effective to promote your best salesperson to be a sales manager? Independence: Best salespeople are used in working independently overcoming all barriers that might block their sales deals. This mindset makes them believe that all salespeople should independently do such job. This would make their managerial job difficult especially in coaching. Self-centered: Salespeople love to remember and talk about their achievements. This would tend sales managers to fall into the trap of telling their people their achievements and how they solved similar issues, rather than developing their salespeople to self-generate solutions to their problems. Marginalizing Salespeople: Being the #1 rainmaker within the sales organization prior to their promotion makes it much difficult for the management to eliminate their selling duties from their new Sales Manager role. They will also have the tendency to run into doing the sales by themselves especially in tough times losing focus on developing their staff for the long-run. Promote someone that can do well the next job and not the last job! Q4. 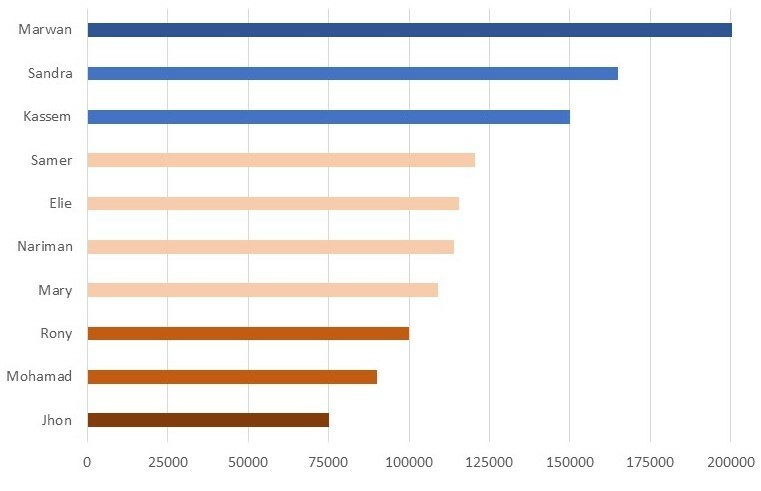 Should we rank our salespeople by performance? But is it best to share it with the entire sales team? Discouragement: some average players with good potential of growth, will be discouraged to some extent and lead to less productivity or even resignation. Less cooperation: between the sales team when someone needs help with a certain account or with covering an unexpected meeting. Because a member might be less encouraging to help or give their best if it will affect their rankings. The ultimate solution would be to post top performers only. Nevertheless, it is important to inform certain ranking information to the rest of the team only in private individual sessions with the manager to give the motive and setting smart goals. Q5. If I have a 60/40 plan, what is the amount truly at risk? is it only 60%? If a sales organization works on a 60% salary and 40% incentive pay, most organization think the 60% is only at risk, however the answer is unfortunately higher than that. There is a hidden salary that most companies miss to calculate which is the carryover. Some salespeople take over older or running accounts, or covered territories and benefit from their incentives with minimal efforts. you might as well call it salary. 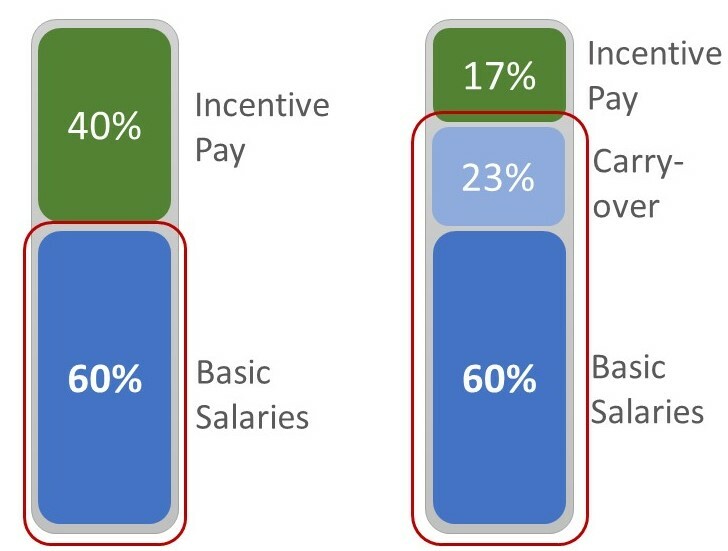 So, the amount at risk is actually 60% + hidden pay (incentive earned) which might reach to 83%.